Scheduled for completion in 2023, a lively ribbon of parks and growing spaces will unfurl along 26 blocks from Belltown to the stadiums. BYE BYE, VIADUCT. Hello, nature. 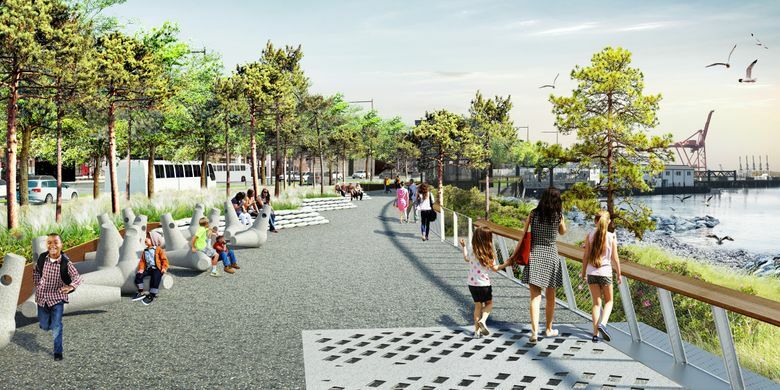 Just as it did with New York’s tremendously popular High Line Park, James Corner Field Operations, a landscape architecture and urban design practice, is transforming our decidedly gray, worn-out waterfront into a charismatic green space designed for people, plants and wildness. Where an elevated concrete stream of cars, noise and pollutants once dominated the edge where our rapidly growing city meets Elliott Bay, we’ll have a living landscape — a lively ribbon of parks and growing spaces unfurling along 26 blocks from Belltown to the stadiums. 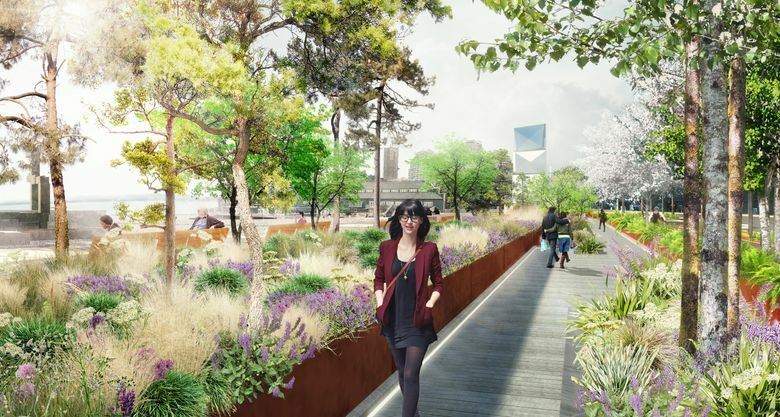 Richard Hartlage, principal of Land Morphology, a local landscape design firm whose Pike Place Market office resides in the thick of the action, has developed planting plans for the future waterfront park gardens. Picture a woodland glade along Alaskan Way populated with dogwood, willow oak and coast redwood trees skirted with blossoming camellias, shrubby cinquefoil and Oregon grape. Or rather than dank shade, open sunny areas filled with flowering quince, colorful coneflowers, textural grasses, resilient ferns and West Coast native plantings. Be still, my plant-loving heart! In this dynamic waterfront of our future, grand promenades and flexible spaces created for social gatherings and live performances will coexist with more intimate landscapes threaded with paths designed for strolling and furnished with benches where you can stop to read, enjoy lunch or simply pause to soak up seasonal blooms. It’s an ambitious vision that looks back in time as well as forward. Habitat Beach, a relatively tiny swath of restored rocky shoreline and native plantings that will be located just south of Colman Dock, is designed to provide a quick course in environmental literacy and show what our native shoreline used to look like. The innovative new seawall, completed in May 2017, has been engineered for the future, enhancing the nearshore environment and providing optimal conditions for migrating salmon and other marine life. Environmentally friendly biofiltration principles are integral to the waterfront planting plans, including contoured beds that will capture and diffuse the rain, while plant roots filter and cleanse runoff before it enters Elliott Bay. The project’s estimated completion date, 2023, is still a ways off. But you can experience the future with a visit to Waterfront Space, an educational resource center where enthusiastic, knowledgeable staff will show you around the project showroom, lead you through a scale model and answer questions. There’s even a free augmented-reality app you can download at FriendsofWaterfrontSeattle.org that places you into the gardens of tomorrow, today. Waterfront Space, at 1400 Western Ave., is open Wednesday through Sunday, noon to 5 p.m.